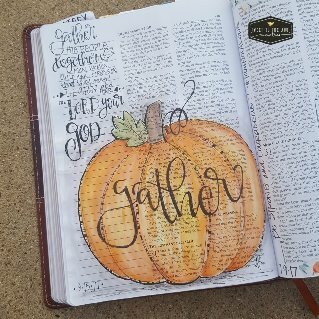 When I began incorporating Bible Journaling into my Bible Study time, I was pretty intimidated by all of the pics of others beautiful journaling. I've always been a doodler and a letterer but a lot of journaling styles didn't really represent a doodling or lettering approach. They looked more like scrapbooking. They were beautiful, but just not me. So I hesitated and didn't begin Bible Journaling because I didn't think what I could see in my heart would "look right". ​So let's just park right there for a few minutes before we begin the Myth-Busting and let me ask you a question. ​Why? 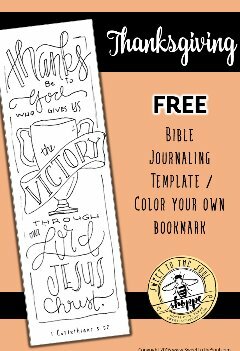 Why do you (want to) Bible Journal? Beyond the, "it looks pretty" and "everyone's doing it" there are much deeper heart reasons. ​Spend time with God - yes, this really is the first and most important reason. When we open our Bible, we open the door for God to meet with us. Invite Him in and He speaks to us. Memorize Scripture - whether this is a why or a by-product, I find that focusing on a single scripture for this concentrated period of time is a great way to remember the scripture verse. Reflect on Scripture - spending time focused on a single scripture and in conversation with God is a great way to really plant God's Word in our hearts. 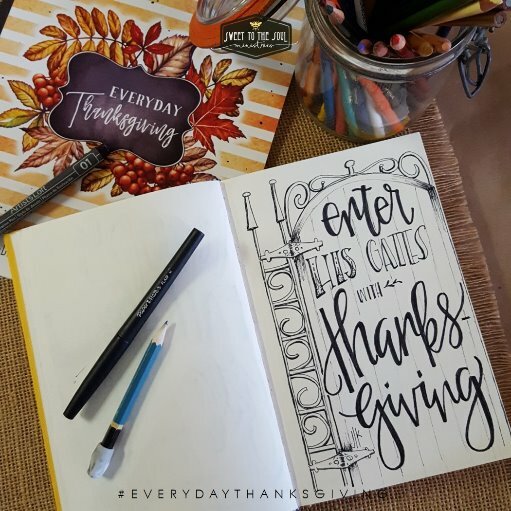 Slow Down- in our crazy fast paced world, Bible Journaling is a great way to slow down and recharge. Feed your Soul - As God's children we need to stay close to Him so our soul can be nourished. Exercising my creative muscles and spending time with God is a double blessing for me. Calm anxiety - there is something so calming about using the right side of the brain. Scientific? Oh, I don't know. Whether that's the reason, or it's spending time with God, I know my stress just melts away when I'm Journaling in my Bible. This is the KJV Journaling Bible from Barbour. I love journaling in it because it is a large size and has extra wide margins. When I talk about Bible Journaling, I hear a variety of responses, but typically one (or more) of three myths that most believe to be true. ​Do any of these sound familiar? Have you said one or heard a friend voice one of these reasons. Let's take a look at each one and see if I can convince your otherwise. 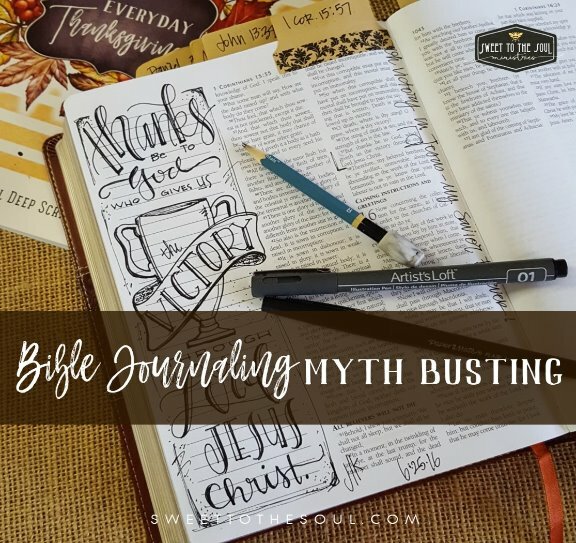 Let's bust some Bible Journaling myths! ​This myth I totally bought into. Even though I would draw and doodle just about everywhere, I thought I had to have an official "journaling" Bible. And, let's face it, they can be expensive. There are plenty of other resources to use as you begin your Bible Journaling adventure. anywhere you can write or draw! ​Remember your "why". Why are you journaling scripture? All of the why's still apply no matter the Bible or resource being utilized. This sketch book is a Royal Langnickel 8.5x5.5 220 page blank sketchbook. ​I like the size because I can drop it in my purse and take it wherever I go. ​First of all, no you don't. Why? Because Bible journaling isn't really about you or your talent. Remember your "why" - this time spent in the Bible is all about spending time with God. And He loves to spend time with you - just the way you are. Besides, God cares more about your heart than your art. 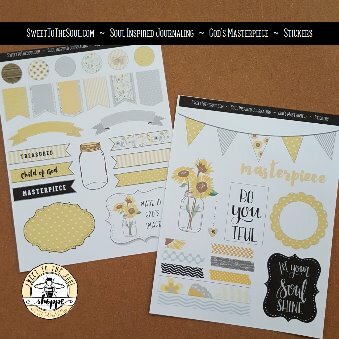 ​I'd also like to invite you over to our Sweet To The Soul Shoppe on etsy, where we have downloadable Soul Inspired Bible Journaling Templates / Color Your Own Bookmarks. Pictured here are our "Proverbs 31 Woman"
This is my fav myth to bust, because I really believed it! I saw all of the beautiful pages by others and felt so intimidated. Surely I had enough supplies in my 'more than I will ever use' craft supply collection. And I did! ​Turns out, my go-to must haves are: a #2 pencil, eraser and a thin black marker. Yup. That's it! Most of the time I don't even color in my designs. I go through a lot of black markers. I also used a couple of different finer point sets, Prismacolor has a wonderful set. Blog update: at a retreat earlier this year someone introduced me to Gelatos. Oh goodness, my world has changed forever! Now I use these all the time to paint in my Bible. ​Yes, there are lots of supplies you can use, but I encourage you to find what fits your personal style and preference. If you do want to move beyond the basic pencil and marker, here are some of my other suggestions. Are you ready to move past the myths and let your soul be inspired? That's great! ​So now you might be asking where do I start? What do I journal? And you can always find lots of great inspiration on Pinterest. ​Thanks for dropping by today Soul Friends! I pray you have found some encouragement to let your soul be inspired! When you do, I would love to see your Bible Journaling! Share it on social media and tag Sweet To The Soul, and use the hashtag #SoulInspired. 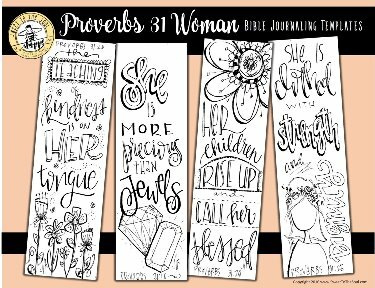 color your own Bookmarks from the Shoppe. 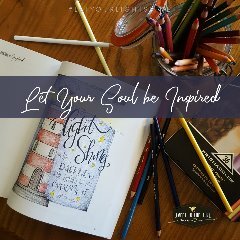 Come visit me on our Instagram for Sweet To The Soul Shoppe and follow along with my Bible Journaling and Soul Inspired worship. 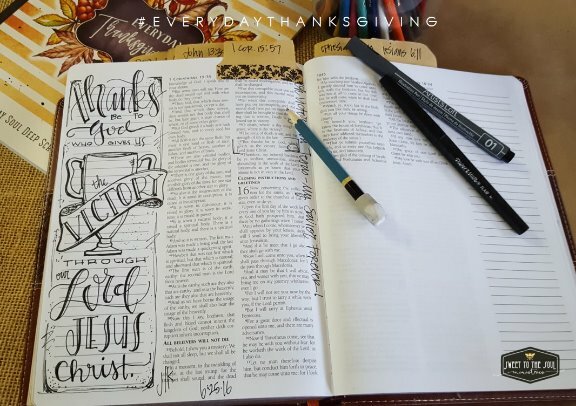 ​Just like worship is a personal experience and reflects the individual, so does Bible Journaling. There are literally unlimited number of ways you can worship creatively with your Bible study. wonderful article, thank you!! sharing this with my group Arizona Bible Journaling on Facebook!